On the June 30 editon of Beck's show, former CIA analyst Michael Scheuer said: "the only chance we have as a country right now is for Osama bin Laden to detonate a major weapon in the United States." Apparently Scheuer thinks that's what it would take to shock the country and its leaders back to their senses. Olbermann was infuriated that Beck didn't "scream at him" or otherwise jump down Scheuer's throat, choosing instead to nod gravely while suggesting that would be the last thing OBL would do. View video here if player not visible. 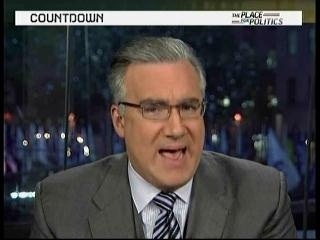 In Olbermann's eyes, nodding in the third degree is a crime warranting legal action to "stop" Beck. KEITH OLBERMANN: Mr. Scheuer has issued a call for the the head of al Qaeda to detonate a major weapon in the United States. And yet, for some reason, to my knowledge at least, the Department of Homeland Security has not yet been to see him, nor been to see Mr. Beck nor Fox News for having provided him a platform and passive assent, for approving not just a terrorist attack which could kill Americans, but approving of one that might even kill Fox viewers. If we're going to continue to prevent terrorism in this country, international or domestic, we have to legally stop the people who view terrorism as acceptable means of effecting political change in this country. People like Michael Scheuer. And we have to legally stop the people like Glenn Beck, the enablers, who simply nod gravely as if the idea, and the speaker are not treasonous.